Who Will Host My #PersonalCloud? I think I inadvertently touched a nerve today. I do like the concept of personal clouds. I have experimented a little bit with Phil’s personal cloud infrastructure at Kynetx. The orange SquareTag in the upper right area of this blog is an artifact of my little experiment to tag my social media places with SquareTags and connect them to my personal cloud hosted by Kynetx. But my question still remains: What companies will emerge as the leading hosters of personal clouds? I don’t want to host my own; I don’t think my wife, as bright as she is, would learn how to do it. I would like my personal cloud to be hosted by a capable institution I trust. I would like Identity credentials I select from my personal cloud to be recognized by every website I choose to visit, and I would like the payment method I choose from my personal cloud to be accepted by every vendor I purchase things from. That will require broadly accepted standards for Identity and payments and the large-scale infrastructure to make it work. I tend to think that it will take some pretty large organizations to pull that off. My vote for an institution to host my personal cloud? My bank. 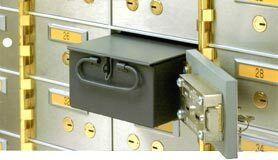 It already has a vault full of things that are like analog personal clouds – safe deposit boxes. I choose what goes in my box and what comes out. The bank can’t get it without my key. Plus, my bank provides a whole litany of payment options. And, I tend to trust them to take are of my money. Perhaps I could trust them with my digital safe deposit box as well. I’d even be willing to pay for it. Will they do it? That is another question. The infrastructure has been in place for some time now – we just need to make good use of it. Any reputable HSP (Hosting Service Provider) is more than capable of hosting a personal cloud (PC). You obviously trust them enough to host your blog – PC is no different. If you host your PC on a fixed IP address (particularly IPV6), your IP address is sufficient credentials for every website to identify you. PayPal is pretty universal. Credit cards are too. Whether a bank or any other institution, the minute they start hosting your PC they become just another HSP. You don’t have to be a bank to provide high level of security for data – many hosts do it already. Most importantly, the main security features such as volts, etc. should be built in to you PC so that you’re not dependant on your host. Expecting the banks to do something outside their core business on a large scale is at best an exercise in patience.